This is a busy week. 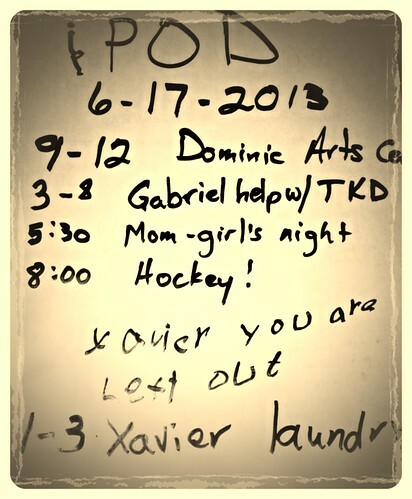 Dominic has camp all week. Our tae kwon do instructors are out of town, and we're helping out with the classes. We have doctors' appointments, dinners with friends, birthday parties, and more. This morning, in an effort to make sure I didn't forget anything, I made a plan of the day and put it on the refrigerator. It started out saying POD at the top, and included all our planned activities. This is what it looked like by the end of the day. Nothing is safe from my children's humor.